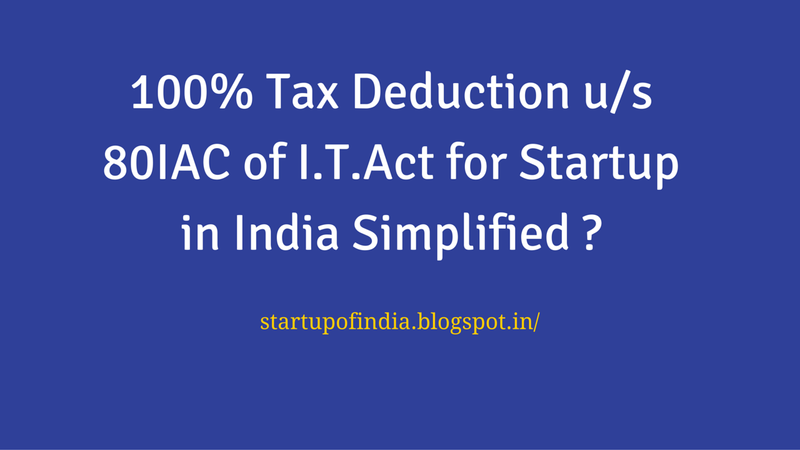 Startup Tax 100% Deduction Under Section 80IAC of Income Tax Act Explained ! Finance Bill 2016 introduced in the budget session contains various tax incentives for flag ship programs of NDA government - startup India . One of the key benefit is 100% tax deduction for startups tax proposal for which government has introduced new provision of tax deduction under section 80IAC of the Income Tax Act . 7 Major Points for 100% Tax Deduction U/s 80IAC ? 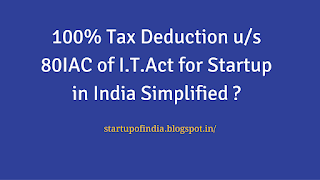 Deduction u/s 80IAC is allowed to eligible startups setup before 01/04/2019 only . The deduction is for eligible business or professional income. The deduction of one hundred per cent. is allowed for three consecutive assessment years. The assessee can chose the start year of three consecutive years out of first five years . be started by splitting up, or the reconstruction, of a business already in existence. it is not formed by the transfer to a new business of machinery or plant previously used for any purpose. 80-IAC. (1) Where the gross total income of an assessee, being an eligible start-up, includes any profits and gains derived from eligible business, there shall, in accordance with and subject to the provisions of this section, be allowed, in computing the total income of the assessee, a deduction of an amount equal to one hundred per cent. of the profits and gains derived from such business for three consecutive assessment years. (2) The deduction specified in sub-section (1) may, at the option of the assessee, be claimed by him for any three consecutive assessment years out of five years beginning from the year in which the eligible start-up is incorporated. Explanation 2.—Where in the case of a start-up, any machinery or plant or any part thereof previously used for any purpose is transferred to a new business and the total value of the machinery or plant or part so transferred does not exceed twenty per cent. of the total value of the machinery or plant used in the business, then, for the purposes of clause (ii) of this sub-section, the condition specified therein shall be deemed to have 10 been complied with. (4) The provisions of sub-section (5) and sub-sections (7) to (11) of section 80-IA shall apply to the start-ups for the purpose of allowing deductions under sub-section (1). (c) it holds a certificate of eligible business from the Inter-Ministerial Board of Certification as notified in the Official Gazette by the Central Government.’.